After the battle, there were some funerals, but mostly celebrations at the remarkable lack of Phandalin deaths. The group argued long about how to split up the money. Turenim suggested they should keep most of their money in a common pool. Some were indifferent and others wanted all the money evenly divided. Moula just wanted to stop carrying everyone's money. Ultimately no money was exchanged, except what Atilius needed to study counterspell, which he eventually added it to his spellbook. With the rest of the group in tow, Albrecht attempted to confront Halia Thornton about her involvement in his manor's demise, but did not learn anything. This encounter led to an interrogation of Albrecht and his motives by the rest of the group. The resulting divide was eventually put aside to focus on more pressing issues. 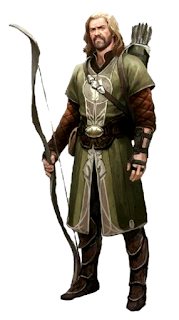 Gundren informed the group that he and Nundro would be traveling to Wave Echo Cavern soon, saying that they would bring Tharden back to Dumathoin’s temple there, and have a priest of Dumathoin summoned to resurrect him. They would begin preparing to resume mining operations. Gundren said they would have Turenim’s armor sent back to Phandalin. In the meantime, Linene Graywind said she was happy to lend Turenim a suit of chainmail in the meantime. She also asked the group if they could investigate rumors of ogres waylaying caravan shipments between Phandalin and Leilon. Moula asked Sildar about where Sister Garaele might have gone, and he suggested speaking with Daran Edermath. Together they all sought out Daran, who said he did not know where Sister Garaele had gone. The old elf mentioned that she had spoken of trying to find The Place of the Unicorn. Obviously worried about the priestess, he urged the group to find Sister Garaele as soon as possible. While Daran spoke privately to Turenim, Sildar allowed Moula to search Sister Garaele’s quarters for clues, but none were found. In the morning the group borrowed a wagon from Linene and, and acting as merchants, set off towards Leilon to find the fabled Place of the Unicorn. That evening they were attacked by three ogres. Turenim cast bless on Moula, Lee, and Julious. Julious cast lightning bolt, and Atilius used his firebolt. Despite dealing a lot of damage, Lee fell during the battle, and had to be revived by Turenim's healing word. Julious used his wild shape to transform into a black bear. It was a difficult fight, with the group picking them off one at a time. As the last one turned to flee, Pippin stabbed it fatally in the rear. Lee found the ogre's tracks, and they followed them into the night, until they came upon two outbuildings that partially remained standing with a fallen over wall and sagging roof. A fire burned out in front of the broken wall and the two wagons sat between these buildings and the large stone building roughly 60 ft away. They saw two ogres outside cooking around the fire and they appeared to speak to others inside the buildings. 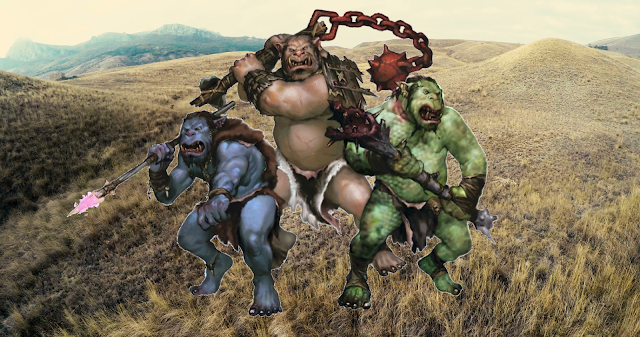 Fortunately the ogres showed no signed of spotting the group.